Little did I know at the time of this captivating presentation that one of the other class participants (who certainly thought I was a complete wacko) would become a very dear friend, my seat-mate for two years of classes together, and a teacher that I greatly respect. How does any of this have to do with chicken curry, you ask? He asked me to make a chicken curry recipe without coconut milk and post it. So I did. 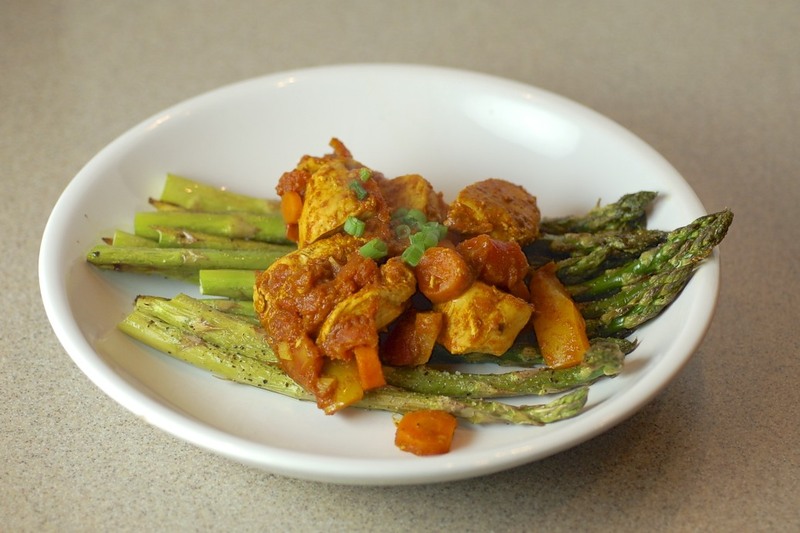 This dish is tasty, flavorful, healthy, and quick! All of my favorites! 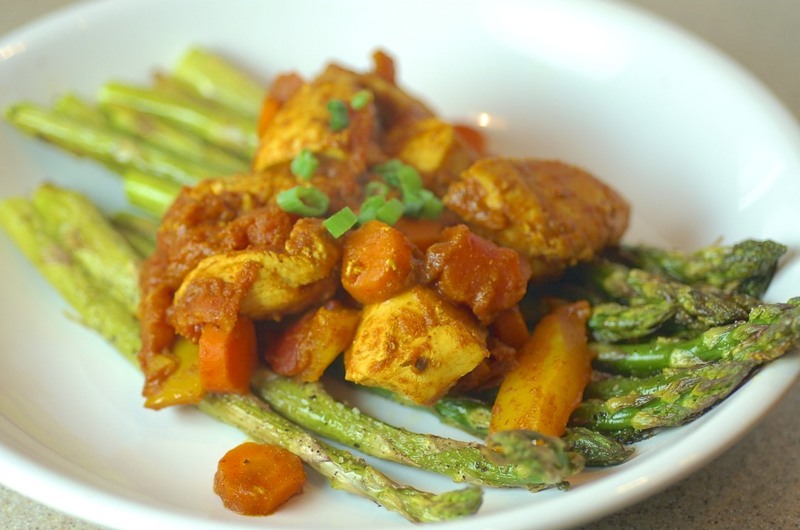 Instead of the heavy, calorie and fat laden curry we traditionally enjoy (because it’s delicious), this is lighter, includes many vegetables, and is served on a bed of roasted asparagus instead of on rice. I used only dry spices found at a regular grocery store, so it isn’t even fancy–although its flavor lends one to believe otherwise. It has the perfect amount of curry and the perfect amount of kick. This will certainly become a regular in the rotation at our house. To everyone else, I know you will love it too. Preheat the oven to 400 degrees. Line a baking sheet with nonstick tinfoil. Line the asparagus on the pan. Cover with a little olive oil (I used basil-infused) and use your hands to rub it all in. Sprinkle with sea salt and pepper. Cook for about 20 minutes, or until your desired done-ness. While the asparagus is roasting, cook everything else. While the chicken is cooking, add another dollop of olive oil to a a large skillet heated to medium-high. Add the onion, peppers, and carrots. Cook until soft. You may need to add a little water to prevent sticking and to help with softening. When the veggies are almost soft, add the tomatoes. Add the spices. Stir and let cook for a few minutes. Taste. Adjust spices if needed. Again taste and adjust spices if needed. Serve on top of the roasted asparagus. Top with green onions and a dollop of greek yogurt.